This document is intended to guide you through the troubleshooting steps for questions and problems with VoIP Headsets and the Cisco Jabber client. Is it a supported headset? Only Jabra devices are supported. Jabra models: Evolve 65, 550, 930, and Evolve 80. Can they hear other audio with the headset? Have the customer listen to music, YouTube, or other audio source. Go to the Gear Icon in the upper-right corner. Choose "Audio" from the left menu. 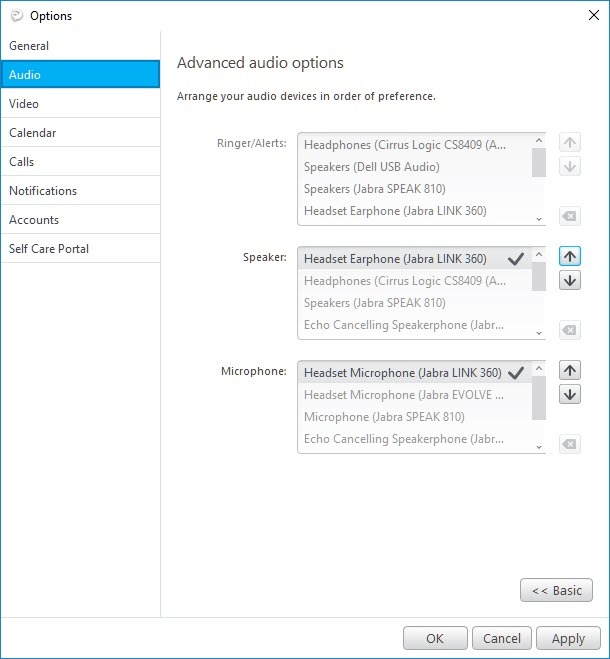 Make sure the headset is selected in the speaker drop-down menu. Note: If the customer is using an Evolve 65 headset, it will be listed as Jabra LINK 360. Adjust the slider below this field to adjust volume. Have the customer test the speaker using the "Play" button to determine if there is now audio. 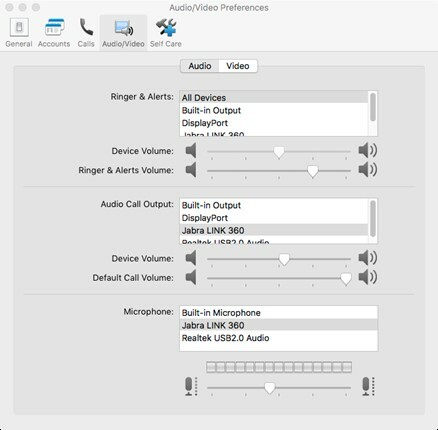 Make sure the headset is selected in the microphone drop-down menu. Have the customer test the microphone by speaking into it. The dots below the microphone field will indicate volume. Press the "Advanced" button. Have the customer arrange the devices so that their headset is at the top of the list for speaker and microphone. The arrows to move the device will not be active until you click on them in the list. Under the Jabber Menu, choose "Preferences." Make sure that "Audio" is selected at the top. Verify that the headset is selected. Please follow the instructions for the customer's operating system. Were you able to resolve the problem following those steps? If they are connecting via campus wired connection, have them connect to eduroam or UW-Net wireless (if possible.) If they are able to get audio, then it is a firewall issue. Please escalate to Cisco VoIP to resolve. If this does not resolve the issue, please escalate to the Cisco VoIP team. 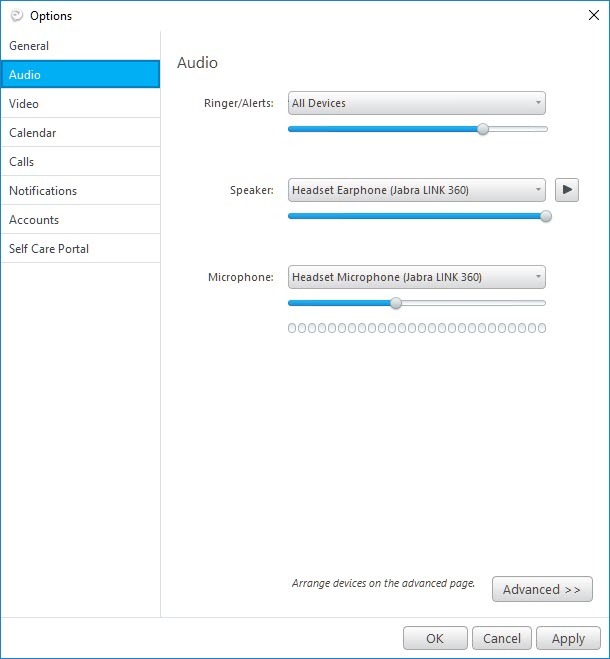 Check audio setting on the computer to make sure that the computer is recognizing the headset. If wireless, make sure that the headset is charged. If it is an Evolve 65 wireless headset, make sure the dongle is plugged into the computer. Computers can connect to these headsets without the dongle using Bluetooth, but the audio quality may suffer. If not wireless, make sure that the headset is plugged in. (If possible) have the customer use another headset to see if the problem continues. If another headset does not work, then there is a problem with the computer. You can also refer them to their local IT support. Troubleshoot with best effort. Do NOT escalate to Cisco VoIP.